Azimi, G., Amini, H., Andalibi, N. (2010). Expression of the Apoptosis Inhibitor Bcl-2 in Sputum Eosinophils in Patients with Asthma. Iranian Journal of Pathology, 5(1), 18-21. Ghasem Azimi; Hesam Amini; Niosha Andalibi. "Expression of the Apoptosis Inhibitor Bcl-2 in Sputum Eosinophils in Patients with Asthma". 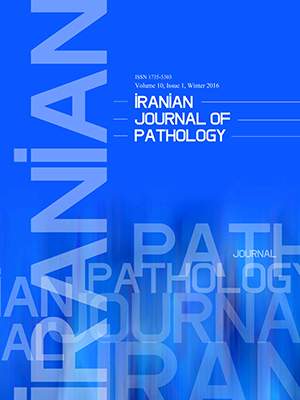 Iranian Journal of Pathology, 5, 1, 2010, 18-21. Azimi, G., Amini, H., Andalibi, N. (2010). 'Expression of the Apoptosis Inhibitor Bcl-2 in Sputum Eosinophils in Patients with Asthma', Iranian Journal of Pathology, 5(1), pp. 18-21. Azimi, G., Amini, H., Andalibi, N. Expression of the Apoptosis Inhibitor Bcl-2 in Sputum Eosinophils in Patients with Asthma. Iranian Journal of Pathology, 2010; 5(1): 18-21. Background and Objectives: Apoptosis of eosinophils is of significant value in assessing the airway inflammation in patients with asthma. Our purpose was to investigate the degree of expression of the Bcl-2 protein in sputum eosinophils during acute asthma exacerbation and its relationship with exacerbation severity. Materials and Methods: The study was carried out in Mostafa Khomeini Hospital, Tehran, Iran in March 2008. Sputum was obtained from 15 asthmatic patients and 13 healthy subjects as a control group. Number of eosinophils was counted and Bcl-2+ eosinophils were stained using immunocytochemistry. Results: Sputum eosinophils and Bcl-2+ eosinophils were significantly higher in patients with acute exacerbation than controls (P<0.05). Conclusion: Bcl-2 prolongs survival and decreases apoptosis of airway eosinophils during acute asthma exacerbation. Eosinophil apoptosis and inhibition of Bcl-2 represent a target for new and effective therapeutic strategies of asthma.